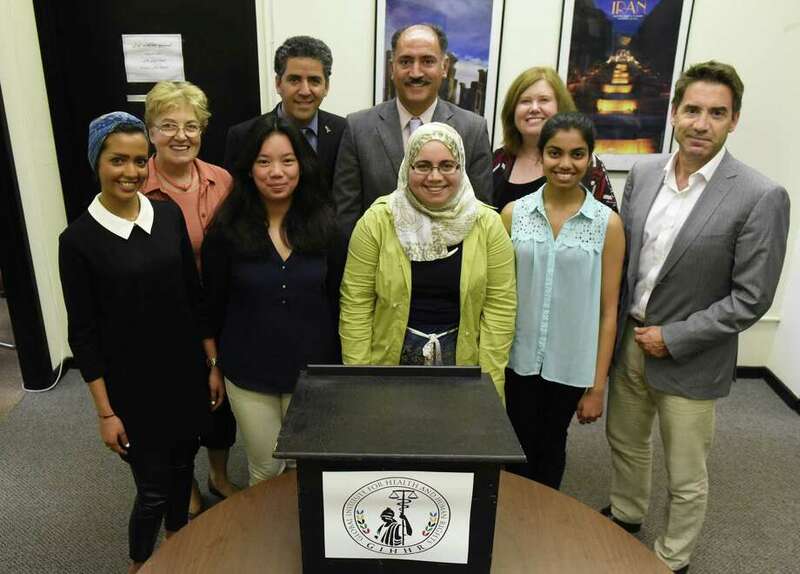 Dr. Kamiar Alaie (rear, center left) and Dr. Arash Alaei (rear, center right) with Global Institute for Health & Human Rights refugees project staff at UAlbany. The Albany Roundtable has selected the Global Institute for Health and Human Rights, its director Dr. Kamiar Alaei, and its associate director Dr. Arash Alaei, to receive its prestigious New Patroon Award for finding hope in the act of learning and teaching at the intersection of health and human rights. The award will be presented at the Albany Roundtable luncheon on Thursday, January 12. The Roundtable usually meets on the second Wednesday of the month but is changing the date of the January 2017 meeting to avoid a conflict with Governor Cuomo’s combined State of the State and Budget address. Since the Global Institute for Health and Human Rights was founded in 2013, it has fostered research, education, policy, advocacy and development, and advanced the understanding and protection of health and human rights in a theoretical, academic, practical, and ethical context. The Institute’s collaborative and interdisciplinary model engages the intersection of health and human rights from a variety of angles, integrating fields of study ranging from philosophy to urban planning to law and public health. The featured speaker for the January 12 luncheon is Albany Mayor Kathy Sheehan, and he luncheon is sponsored by KeyBank N.A. Reservations are required and seating is limited. The cost for the luncheon is $20, which may be paid at the door. The Roundtable also offers its guests the option of paying in advance with a credit card at www.albanyroundtable.com. The University Club will serve a hot and cold buffet from 12:00 noon to 1:00 p.m., with the program commencing at 12:30. Reservations for the January 12 luncheon are required by Friday, January 6 and may be made by prepaying online, by calling 518-431-1400 (the Capital Region Chamber) or by sending an e-mail to albanyroundtable@yahoo.com.